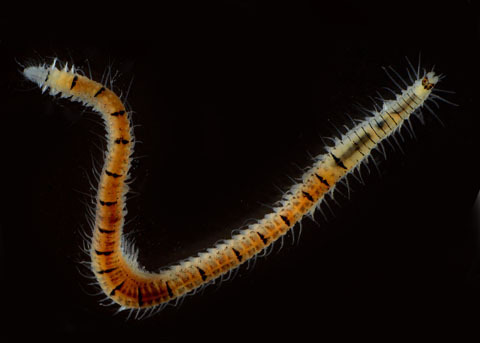 Odontosyllis phosphorea is a segmented organism that is a few millimeters in length which can be found in the benthic zones of salty waters. Each segment of the species’ body has two appendages, one on either side. Individually, the appendages are referred to as parapodia. O. phosphorea accomplishes movement through the use of parapodium which enables the species to swim, crawl, and burrow (Hesselberg and Vincent, 2006). The number of parapdoia present vary, ultimately depending on the length of the organism. Parapodia are composed of internal semi-rigid chitinous structures, the aciculum used for muscle attachment, and the external sensory organ, the cirrus (Smith, 1957). The parapodium are able to move through the use of various muscles which run from the body segment down to each individual parapodia. These groups of muscles allow for the forward and backward motion of the parapodia (Hesselb erg and Vincent, 2006). Parapodia are able to be partly retracted into the body through the use of other muscles attach to the aciculum (Mettam, 1967). When swimming, O. phosphorea are able to create thrust via their parapodium (Gray, 1939). During the recovery stroke, the parapodium retract as opposed to power strokes during which the paradodium protract (Mettham, 1967). This species mainly swims during mating periods which take place near the surface of the water. Individual parapodia are able to move independently, however, due to the physiological construct of their bodies, motion has limited degrees of freedom. Parapdodia pairs are asymmetrical and can vary in morphology, such as length (Hesselberg and Vincent, 2006). Teeth are also present on the parapodium which allows the organism a better capability for movement and burrowing (Trevor, 1977). 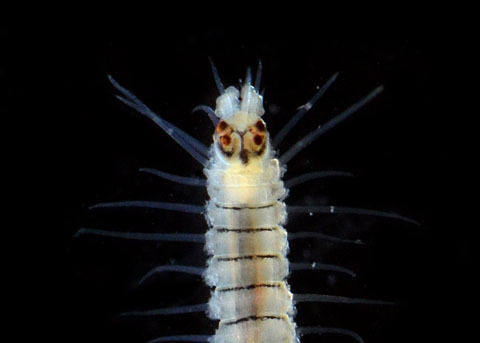 The teeth are beneficial because O. phosphorea spends the majority of its time in the benthic zone around rocks and other sediment. Often times these teeth are slightly hooked for a more versatile function such as attaching themselves to tubular structures they create as shelter. This attachment to their shelter decreases the predators’ chances of successfully consuming the organism. Organisms’ eyes are also a crucial aspect of being able to escape predators. Although little is known about the visual sensory system of Odontosyllis phosphorea it can be compared to that of Ophryotrocha puerilis. O. puerilis has a pair of eyes located in the peristomium. Each eye consists of one sensory cell and two supporting cells (Rhode, 1990). The morphology of the eyes suggests that they can actually be referred to as protrusions from the brain. The reason why this reference can be made is because the sensory-supporting cell complex is enclosed by a basal lamina which is identical to the neural lamella (Rhode, 1990). The visual sensory system of O. phosphorea is not only crucial for scavenging for food and evading predators, but also for reproductive success. O. phosphorea uses its vision to locate the bioluminescent light being emitted from by their mate during reproductive periods. Without a keen sensory system, O. phosphorea would not be able to successfully produce offspring which would be detrimental to the survival of the species. Another aspect which is crucial for the survival of many annelids, including O. phosphorea, is their defense against harmful bacteria and parasites. Just as humans have immune systems, O. phosphorea do as well. This cellular immunity against pathogens is facilitated through active phagocytosis by coelomcytes (Dhainaut and Scaps, 2001). Through this process, parasites and other detrimental bacteria are encapsulated where they are deactivated and broken down by antibacterial proteins such as lysozyme. Often times, the response of this defense mechanism is due to stress-induced proteins which can be brought about by physical or chemical stimuli. An efficient immune system allows O. phosphorea to fight off many parasitic and bacterial agents which would otherwise be costly to the function of this organism as a whole. Are you lost? Go back to our Home page.